VIVANI supports Kindernothilfe’s prevention projects against child labor in Haiti with an annual donation of 25,000 €. Kindernothilfe manages numerous prevention projects in various provinces throughout the country. Kindernothilfe guarantees high-quality project work with the promise of an efficient, impact-oriented use of all donations. We are very pleased to have found such an experienced partner in Kindernothilfe, a partner with the necessary know-how and tactfulness. Without whom nothing could be achieved given the difficult circumstances that encompass the country of Haiti. Providing approximately 600 girls and boys with new perspectives through a high-quality education tailored to their specific needs. Free school meals for roughly 600 children with ingredients cultivated in school gardens, among other places. Purchase and distribution of seeds for school gardens. Providing training for parents and children in organic farming. The people in the mountains of Carrefour live very secluded lives. The villages in the middle of the mountain are only accessible on foot (5-12 hours depending on the location of the village) and lack infrastructure of any kind. Government intervention rarely reaches the hard-to-reach region, leaving residents with little access to hospitals, schools or government assistance. 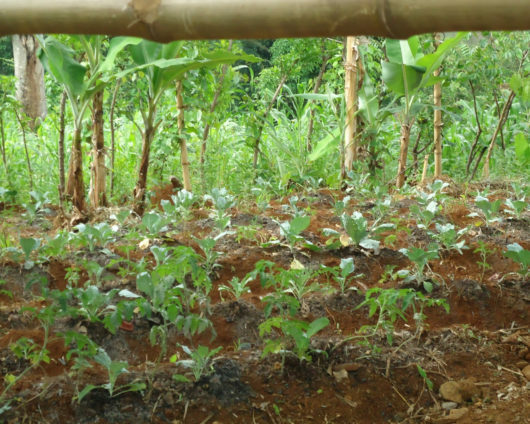 The majority of the population lives off of small-scale subsistence farming. The everyday life of families is characterized by poverty, hunger, and hard work. Farmers struggle with difficult soil conditions due to slopes, lack of water, and harsh weather conditions. The children suffer from sickness, malnutrition, and lack of access to a proper education. Due to these harsh conditions parents often send their children to relatives in cities, acquaintances, or even foreign “host families “. The parents do this with the hope that their kids will have the proper surroundings to succeed and ultimately lead a better life. Many of the Haitian cities suffer extreme poverty, and the hopes of a better life are often times not fulfilled. In the city, children often have an even tougher future living in a “host family”. These children are known as the Restavèk child (from the French word “rester avec“=”stay with someone“). In these homes children are often exploited as laborers. They often are tasked with chores like: cooking, cleaning, washing, and hauling heavy water canisters. Sometimes these children are forced to sleep on the ground of the host families and eat whatever little leftovers the family may leave behind. 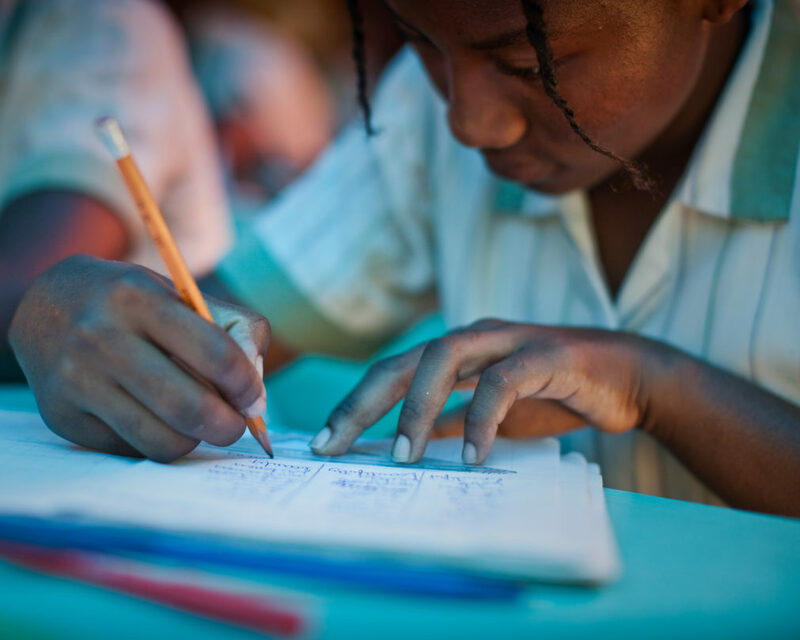 The Restavèk practice is widespread in Haiti with some 300,000 boys and girls working away from their families. Kindernothilfe is working with the local RECMOC community school network to reduce poverty and improve living conditions of the families in the Carrefour mountain region. In addition to providing opportunities for better education and health care they are also making improvements in the village’s nutritional conditions. Agriculture and ecological knowledge is being passed down to the families, so that the farmers may protect or increase their crop yield. 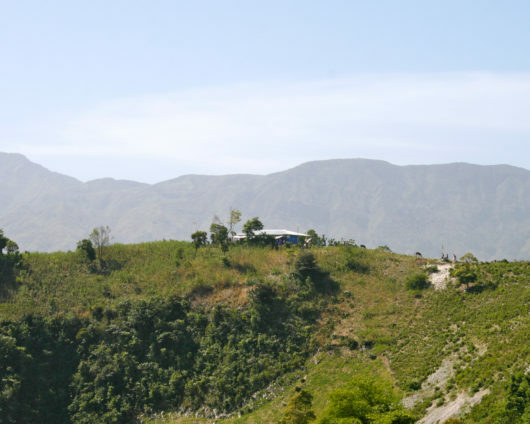 This allows the families to gain a new perspective of their home in the mountains; thus, no longer forcing parents to send their children to the city. This project makes a clear preventive contribution against the exploitation and violence of children in regards to the Haitian Restavèk problem. After the 2010 earthquake, Kindernothilfe rebuilt small community schools in six mountain villages and now ensures their operation. More than 600 children between the ages of 8 and 20 currently have the opportunity to attend school in the mountains of Carrefour. They are no longer forced to leave their homes in search of a good education. Many of these children have never had the opportunity to attend an educational institution prior to enrolling in these community schools. The reason simply being because there was never a school in the immediate vicinity or their parents did not have the financial means to send them away for school. The children in the villages of Coupeau, Bois Matin, Dicou, Volant, Daveau and Bouvier now have access to a solid foundational education as well as the proper materials required for learning. Besides the fact that children can now attend school, the quality of teaching is also an important factor that Kindernothilfe supervises. Teachers have taken part in special training courses run by AMURT, a Kindernothilfe partner. AMURT’s goal is to strengthen participatory teaching methods in these schools. It is also very important that the children have a curriculum tailored to life in these rural areas. The children must acquire practical life skills that are specifically suited for their respective situations. In addition to their education, lessons in organic farming are provided. For example, craftsmanship skills are taught to help teach the children useful tools for everyday life. Each kindernothilfe school has their own garden in which the ingredients are produced for later usage by the school’s cafeteria. Any additional food is purchased on the local market, providing an additional source of income for the surrounding small farmers. This system not only provides for the children, but also supports and strengthens the local farmers market. The operation of school cafeterias and their ability to provide a free meal to students relieves a huge burden for less fortunate families in the area. In order to improve overall health; as well as provide care in immediate emergencies and illnesses, the communities are equipped with first-aid kits and medication is made readily available. In every school there is a person who can be contacted for health purposes. At the same time, regular awareness workshops on basic hygiene are held for both parents and children. This is crucial for informing families to health issues such as preventative measures against infections. The projects activities also aim to improve the children’s nutritional situation; which in return has a positive effect on their overall health. Each school has their own garden that the projects acquire and distribute seeds to. The food for the school cafeteria is produced within the school garden. Courses in organic farming are offered as an integral part of the curriculum, with lessons being held for half a day each week. The parents of the children also receive training in agroecology each semester. Children and parents together are trained in children’s rights and environmental protection, and on top of all these courses lessons for adult literacy are even offered. The sustainability of the project is ensured by the strong involvement of the communities and their members. The feeling of “ownership” is firmly anchored in the fact that the residents themselves helped build their own schools and gardens. The local municipalities have decided to provide an annual financial donation to the maintenance and operation of the schools and gardens. The long-term goal is for the state to one day take over the schools, while being able to bear the costs for teacher’s salaries and school materials.